4 0 S U P P L E M E N T T O O U T P A T I E N T S U R G E R Y M A G A Z I N E A U G U S T 2 0 1 5 O rthopedic surgeons are the carpenters of surgery, chipping and hacking away at bones to make over ailing patients. 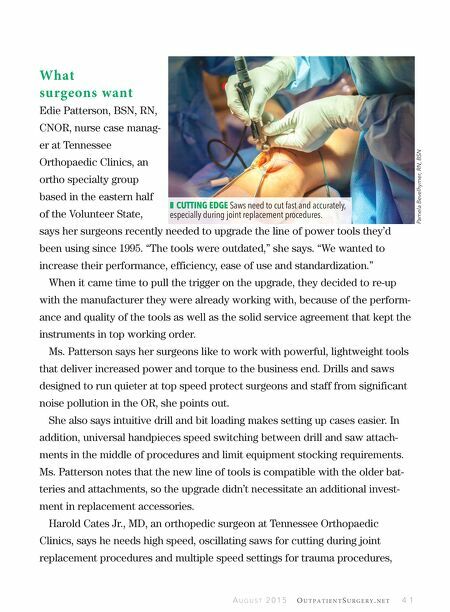 The powered saws and drills they use on a daily basis are arguably some of the coolest tools in surgery, and indispen- sable to repairing or replacing damaged joints. If you haven't shopped the latest options in power innovation, now's the time. 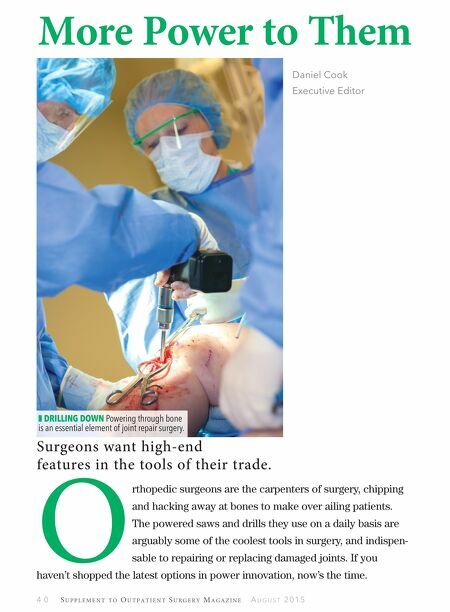 More Power to Them Surgeons want high-end features in the tools of their trade. Daniel Cook Executive Editor z DRILLING DOWN Powering through bone is an essential element of joint repair surgery.